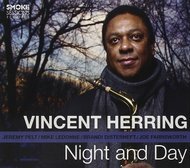 The alto saxophonist Vincent Herring projects his sound in a strong, centered beam, and even his most intense moments suggest a controlled combustion. You could chalk that up to experience — Mr. Herring, 50, has been playing seriously since his teens — but it probably has as much to do with disposition. There’s footage of him with Horace Silver’s band in the 1980s, sounding like he does now, slashing but calm.